To the observer, it may look as if I've abandoned this blog. Not (quite) true. In February, I spent 3 amazing weeks in Japan, and then immediately on return, began honours study in Philosophy, which threw me into crazy levels of reading and writing, and therefore less time than before for experimental cooking. I was working on a few things, but somehow failed to get them to a publishable state. Apologies! To make up for it, here is a truly decadent hot chocolate recipe. I was at San Churros with a friend, and had the revelation that surely I could reproduce their $6 Spanish Hot Chocolate at home, for much less. My first attempt, used a mixture of coca and melted chocolate, but didn't quite taste right. The second turned out as thick chocolate custard - not a success as such, but not exactly a failure either. After a few more attempts, and I hit on the winning formula. Rich and thick, sweet but not too sweet, and a hint of chili to really warm you up on a cold and wet winter's day. Because of all the cocoa, the amount of sugar listed below is enough to make it just-barely sweet. You may want to add another teaspoon if you prefer yours sweeter. The chilli is optional, but really makes the drink in my opinion. This recipe also multiplies really easily - I've done up to six servings at once, just multiply it out, and see how many lives you can improve. Note, however, this drink is not for the faint-hearted, it is truly rich and decadent. Add soymilk, cocoa and cornflour to a small saucepan. Whisk together over medium heat, ensuring that everything is well combined before the milk gets too warm. If in doubt, whisk together first, then heat, but I'm impatient. Bring to the boil, whisking constantly, until mixture boils. Reduce heat, and keep stirring for 1-2 minutes more, or until desired thickness has been achieved. Whisk in sugar, vanilla, cinnamon and cayenne. Transfer to a mug (a silicone spatula is handy), and enjoy chocolate-induced bliss. Towards the end of last year, we had visitors, including a 6-year old. One night, I made a lentil walnut loaf (this one), which the adults enjoyed, but I'm pretty sure she only ate it because her mum gave her a stern talking to about eating what other people prepare. The next night, I thought it would be nice to make something kid-friendly, no lentils in sight, preferably as indistinguishable from the real thing as I could make it. It paid off. The "not hungry" little girl had one small serving, then a second. This was followed up by a third helping, minus pasta, during which she learned that there was no meat in the sauce, after which she followed up with another 2 small sauce-only serves. Win! I've made it several times since - it turns out that Hunter also enjoys the kid-friendly recipes quite a lot. Heat oil in a large saucepan over medium-high heat. Cook onion, carrot, celery and garlic, stirring, for 5 minutes or until softened. Add the dry TVP and stock mixture to the pot and cook over low to medium heat until water is completely absorbed. Add the tomato paste, tinned tomatoes, Italian herbs, chilli flakes, sugar and water. Bring to the boil. 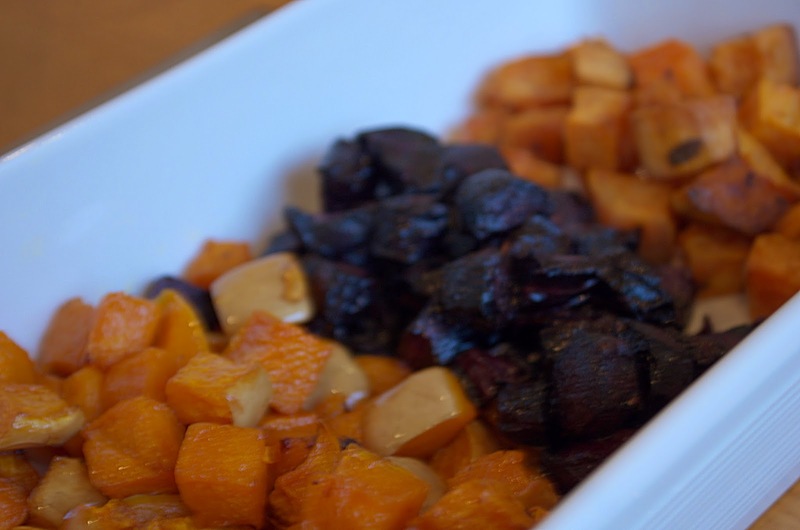 Reduce heat to low and simmer, uncovered, for 15 to 20 minutes or until thick. Season with freshly ground black pepper. Meanwhile, cook the spaghetti according to packet directions. A little bit of olive oil in the cooking water helps to prevent the spaghetti sticking together. Drain. 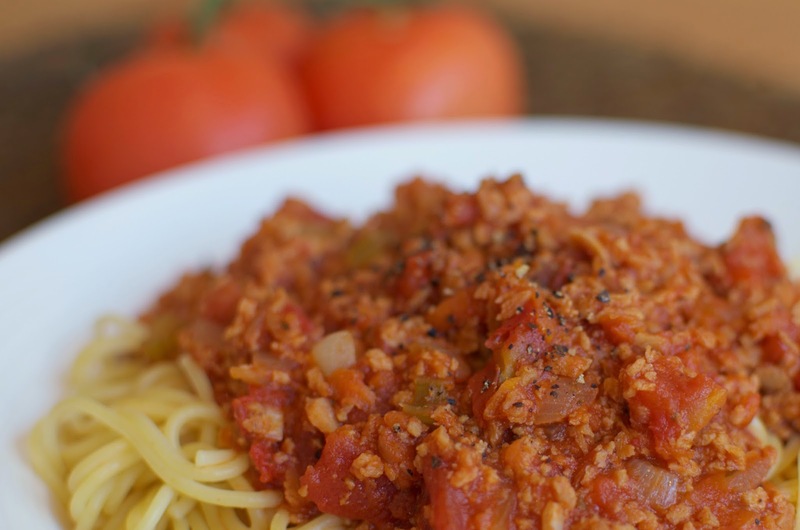 Serve bolognese sauce atop pasta, with extra freshly ground pepper, and nutritional yeast if desired. Originally, I prepared the "mince" first, removed it, cooked the onion mixture, and then added the "mince" back, but this is easier and there doesn't seem to be any perceptible flavour difference. Cut back on the oil at your own risk, as TVP, unlike mince, doesn't contain any fat at all, and needs some added fat to make it taste right. You can probably use less oil than me though. TVP can be bought from Indian grocers, and no doubt other places as well. It's much cheaper than frozen vegan "mince", and also lasts more or less forever in your pantry. The amount of chilli I add isn't enough to give it any bite whatsoever, but it still lifts the recipe. I've been slack on the blogging front lately. I've been playing with lots of recipes, but haven't been able to get anything to a level where I'm happy sharing it here. In the meantime, here's an overdue post, the dessert from our early Christmas dinner. This dessert took a bit of assembly, but the result is rich, decadent, and visually impressive. Mix all the berries in a bowl, sprinkle with maybe 2-3 tablespoons of sugar and 1-2 tablespoons of vanilla. Feel free to add other flavourings if you like, a splash of liqueur would go well. Stir gently, cover with clingwrap, and put in fridge, at least for 2 hours and preferably overnight, stirring every now and then if practical. The berries will soften slightly, absorb the vanilla flavour, and create a deliciously sweet berry syrup. The mousse component was Miyoko Schinner's Ultimate Chocolate Mousse, which I can vouch for as being excellent. I used Green and Black's 70% dark chocolate (vegan and fairtrade), and the full 1 cup of coconut solids still resulted in a very dark and rich mousse - perfect for my tastes, but still a bit too strong for Hunter. 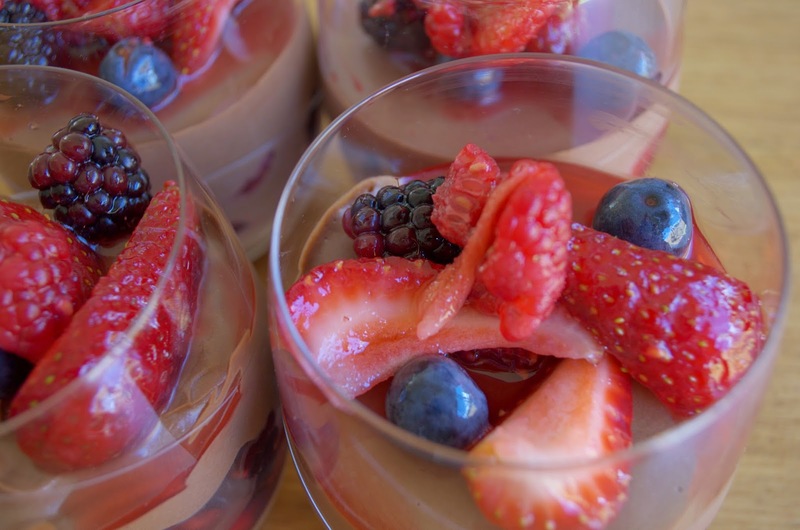 Refrigerate the mousse for about 15-30 minutes before assembly - if it's too runny, it will run down around the berries and cover them, but if it's too stiff you won't be able to get smooth layers. 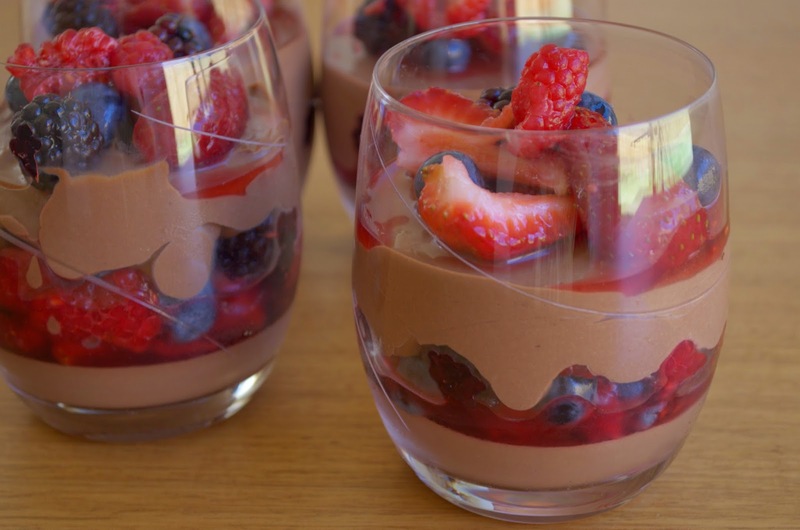 In a glass of choice (I used a tumbler, but a martini glass would work also), spoon a layer of mousse into the glass, add a layer of berries with some syrup, another layer of mousse, and another layer of berries. 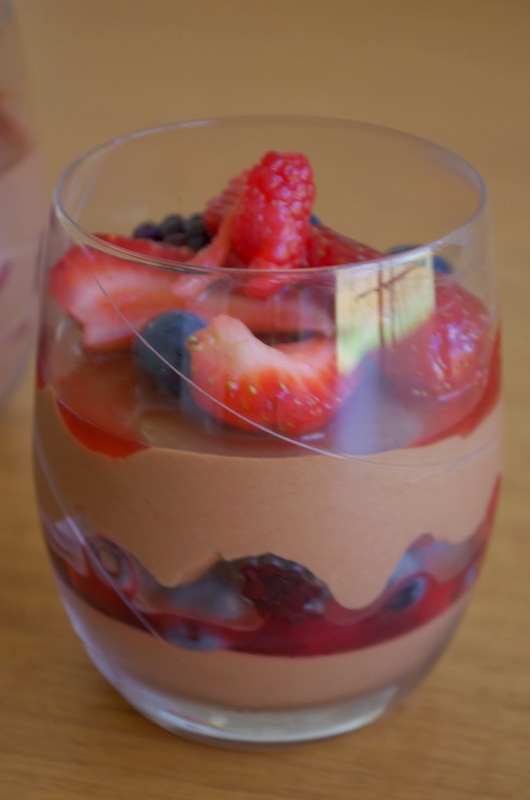 I found it better to make fewer thicker layers, as if I tried to make my berry layers too thin, the mousse ended up largely hiding the berries. I also didn't refrigerate the mousse before starting, which I think was part of my problem, the last one I made had much more defined layers, but also a rough top, so feel free to play around with it and leave comments on what did and didn't work for you. Mum and her new husband are in Melbourne at the moment, so yesterday we celebrated an early Christmas together. 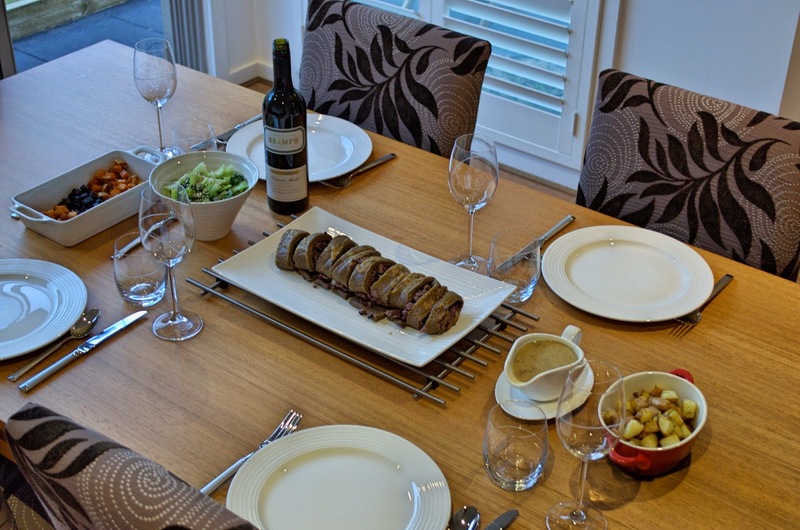 While, in my less sane moments, I dream of cooking up a Christmas feast for a dozen plus people, cooking a fancy dinner for just four was quite enough effort. The photos aren't brilliant as I took them in a hurry so that people could start eating, but they give an idea of what was on the table. 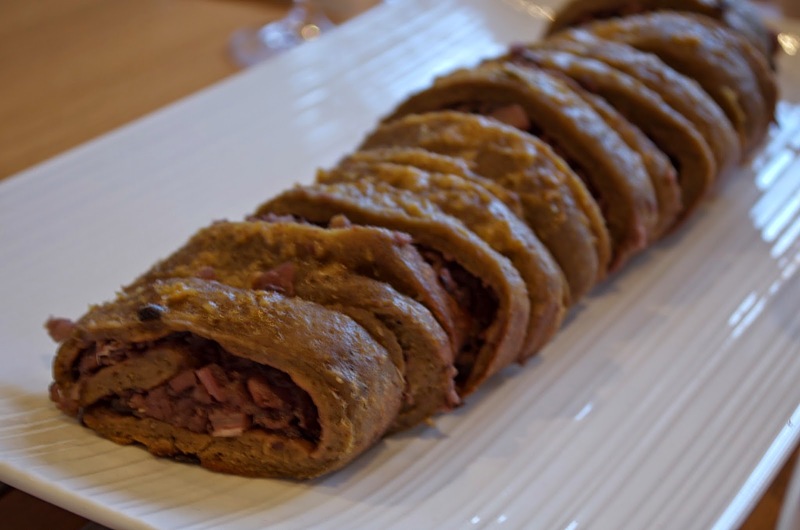 The centerpice dish was a Seitan Roulade, from Food Craft Lab, the sister site of veganbaking.net, run by the same guy. This was quite a success. Mine wasn't quite as well rolled as it should have been, but put flat and viewed from above, it looked pretty good. If you want to try this, it's a bit of effort, but worth it. If you want to try this, I found that kneading for the full 5 minutes, as I did on my test run, gave a slightly tough result, probably because it gets a little extra "kneading" in the sheet forming process. The second time, I kneaded for only 3.5 minutes, and that had a better texture. Also, the glaze may need a bit more water, and easily makes enough for two roulades, probably enough for three. This was accompanied by Gracious Vegan Gravy, also from Food Craft Lab. 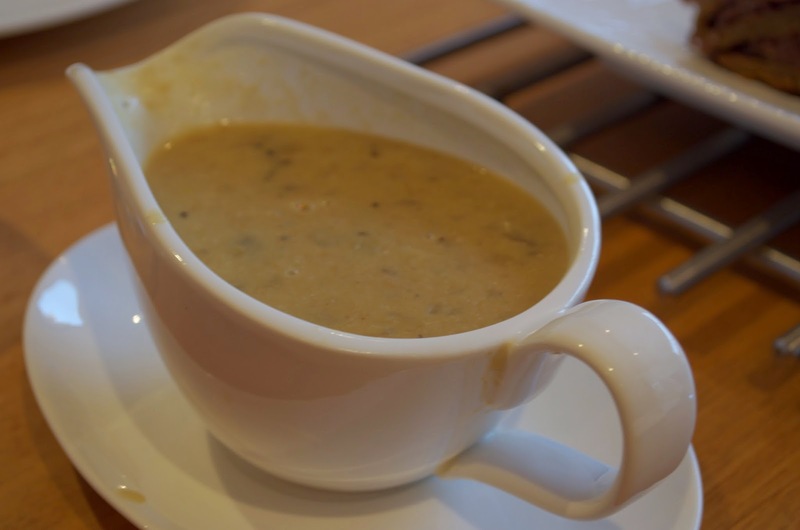 This is not a quick gravy, but it is seriously good. I recommend making it a day or two before so you one less thing to worry about. 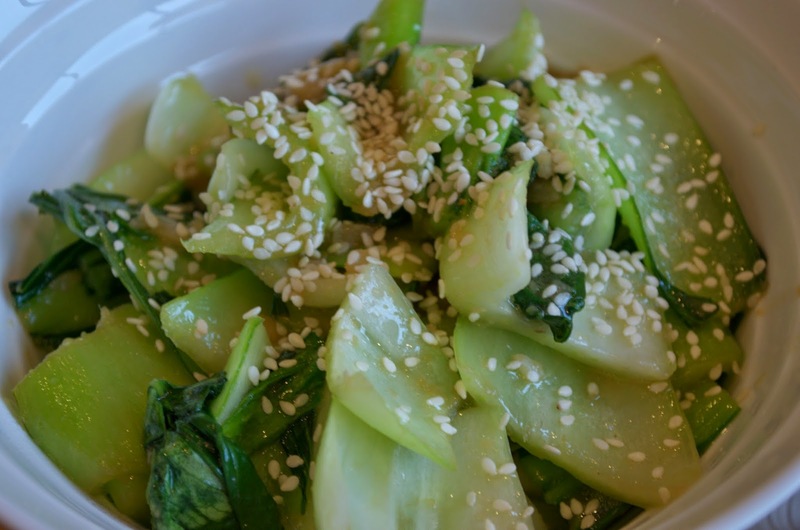 Stir fried Bok Choi - made as per Veganomicon p. 113 and sprinkled with sesame seeds on top. I thought I had over-catered, but before long, all that was left was a little roulade and gravy, along with some overly full and lethargic humans. There was also dessert, but dessert deserves a post of its own. Saturday was my birthday, so I baked myself a cake. Happy birthday to me! Since it was my birthday, I chose to have a chocolatey chocolate cake. What else? The cake recipe was from veganbaking.net, topped and filled with a (not quite) double amount of Rich Chocolate Ganache from of Vegan Cupcakes Take Over the World, p. 143, and drizzled with melted white chocolate. A friend helped with the strawberry arrangement. I would never have thought to stand them on end like that, but I was quite pleased with the result. 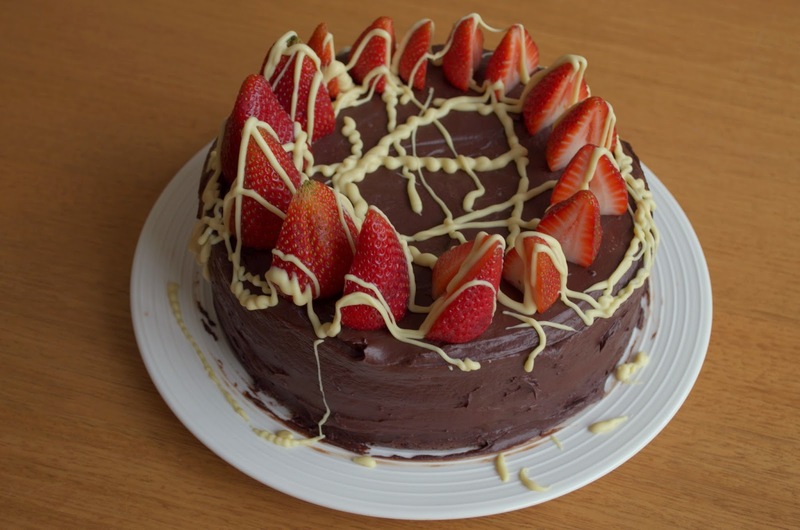 If you're looking for a rich vegan chocolate cake, this is a good one. 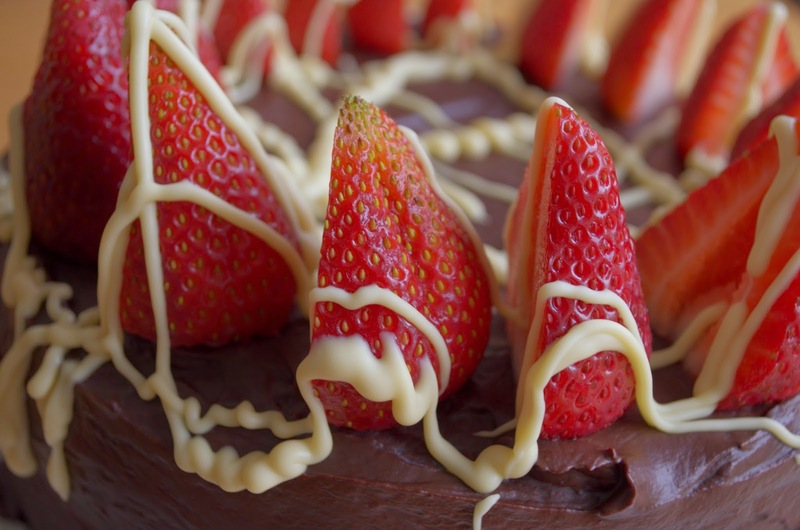 You could look at it as a rich chocolate cake, or a light mud cake. Either way, it was good. 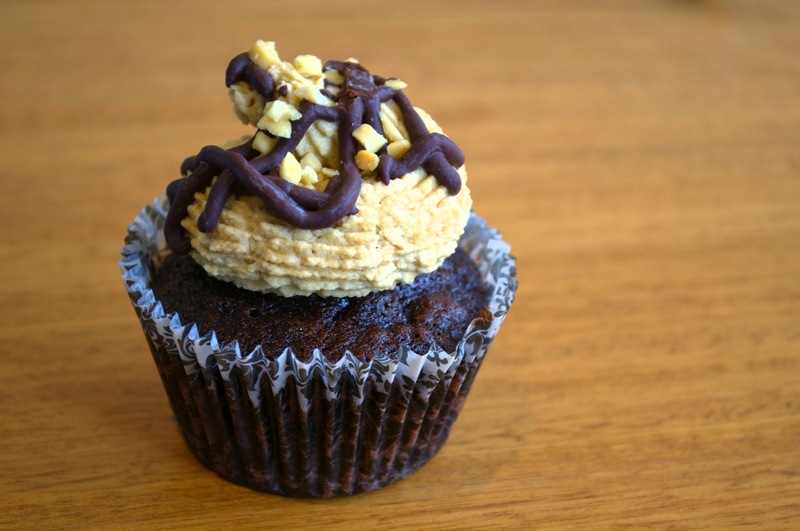 The cake recipe explicitly said to use natural, not Dutch processed cocoa powder, and someone commented that they had had poor results using dutched cocoa. However, I bought a 5kg bag of organic fair trade Dutch processed cocoa powder earlier this year... The cake still rose as it should have. If you're Australian and confused about what I'm talking about, most cocoa in Australia is dutched. I didn't have any bread flour on hand, so I mixed vital wheat gluten/gluten flour into ordinary plain flour. Use 1 teaspoon per cup. I removed the equivalent amount of plain flour first, or, in other words, used 1 teaspoon of gluten flour for 1 cup minus 1 teaspoon of flour, though that may have been unnecessarily pedantic. I went easy on the espresso powder, because I didn't want a coffee flavour in my cake. There are two layers of cake here, sandwiched with chocolate ganache. To do this, I doubled the recipe and spread it between two cake tins. Be careful watching the cake towards the end. I tested mine at the minimum time, and it was still underbaked, but a few minutes later, the toothpick came out completely clean, and I was aiming for not quite clean to ensure moistness - and it was on the dry side, though not badly so. There is a lot of cake here. You could get at least 16 slices out of this. 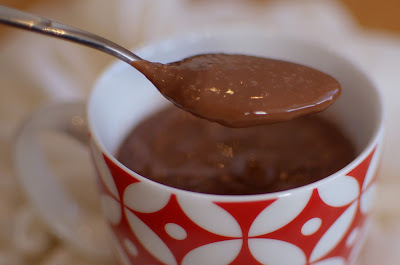 Just dip a spoon in melted chocolate and gently drizzle it from a height. This will produce a thick and thin result, but I've done it in the past for other applications, and it still looks great. Snip the corner off a ziplock bag, fill it with melted chocolate, and use the snipped off corner as make-shift piping tip. The hole should small, err on the small side, you can always make it bigger. No new recipes today, I'm afraid, But I have some pictures of my recent efforts that I want to share. Yesterday was a good friend's birthday, and as I'm finished exams (Yay me! ), I tried my hand at some decorated cupcakes to take along. This is only my second attempt at piping icing, and my first attempt at 2-part piping (the buttercream, and the ganache), but I think they looked impressive enough, if not exactly the product of an experienced and steady hand. Unfortunately, most of the photos didn't turn out (the photos of all the cupcakes laid out in rows for a start), but here are a couple of half-decent ones. 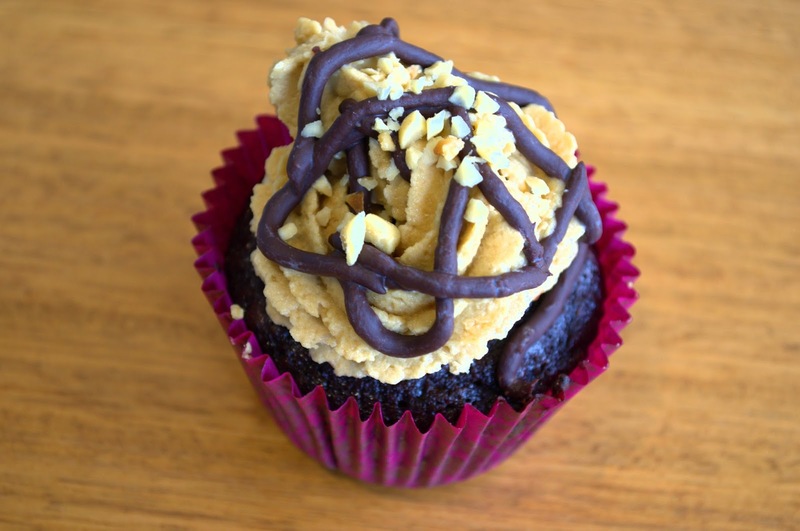 The recipe I used was the Peanut Butter Bombs on p. 37-38 of Vegan Cupcakes Take Over the World . I followed the instructions exactly, except that I only used 2 cups of icing sugar in the frosting instead of 2.5, and didn't add any soymilk to thin it out as a result. The icing was still more than sweet enough. I was a bit concerned that with less sugar, the icing mightn't be stiff enough, but I iced them the night before, and the icing was still well-defined the next day. I also sprinkled them with crushed nuts instead of chocolate shavings, for no particular reason. I can see more decorated cupcakes in my future. I tend to eat a lot of pasta, I suspect most vegans do. 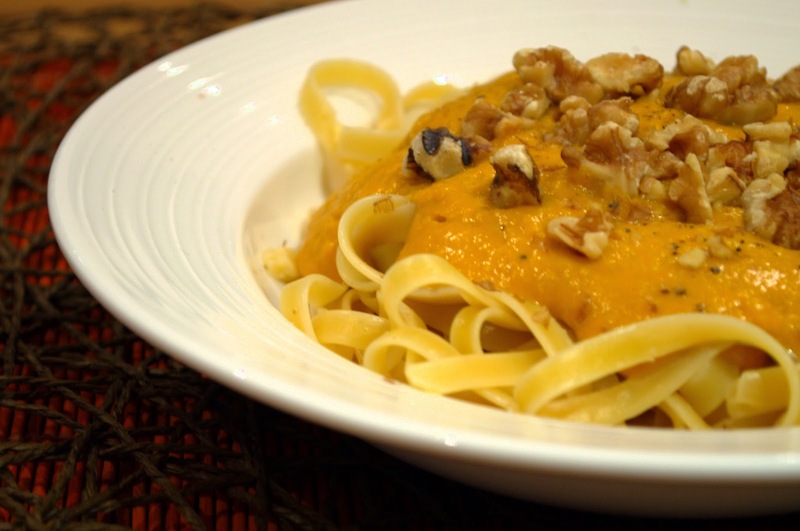 It's quick and easy, but tomato based sauces can get repetitive, and creamy sauces just aren't an everyday thing. 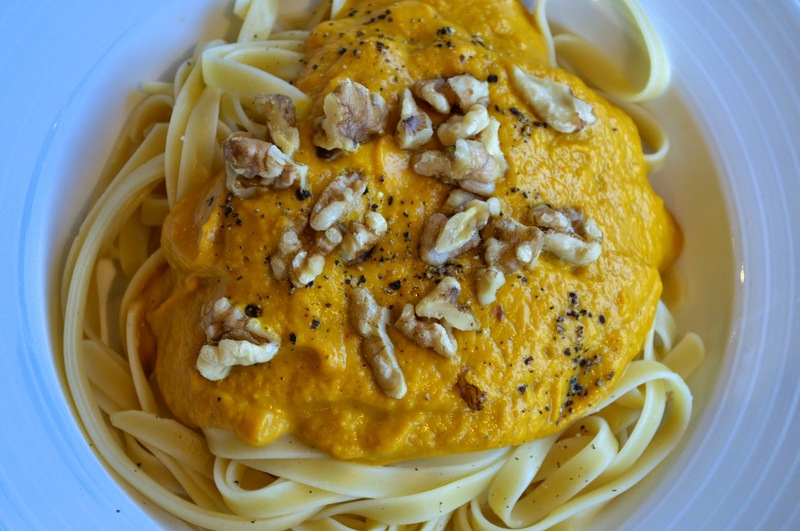 I usually have a chunk of pumpkin mouldering in the back of the fridge... pumpkin lasagne is good, why not pumpkin pasta sauce? 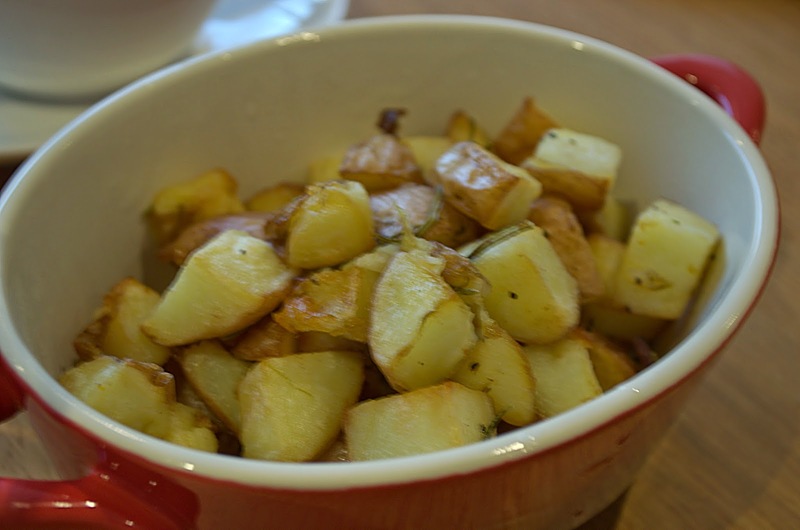 The first time I made this, I raved about it for days afterwards, it really is that good, and simple enough to make for an everyday dinner. Get water boiling, and then prepare fettuccine according to packet directions. While waiting for the water to boil, in a medium saucepan, cook onion and garlic until translucent. Meanwhile, dry-toast walnuts in a frying pan or in the oven until fragrant (optional but worth it). Use an immersion blender to puree. Alternatively, cool, and transfer to a blender.